(Rick Egan | The Salt Lake Tribune) This sign was in front of the Aspen Grove Rustics store on Main Street in Heber City, until The Department of Occupational and Professional Licensing came into the store, and confiscated the CBD oil they were selling on Dec 21. Wednesday, December 27, 2017. U.S. health officials are urging states to regulate marijuana oil extracts after investigating a rash of illnesses tied to the products in Utah. In a report released Thursday, the Centers for Disease Control and Prevention found that synthetic products falsely labeled as cannabidiol, or CBD, sickened as many as 52 people from October through January. CBD is derived from cannabis but is designed not to produce a high. Users say it provides relief from pain and can fight seizures. This year, Utah passed a new law that supporters say will prevent the illnesses from happening again. The oil had previously been in a legal gray area. It’s been legal for people with epilepsy in Utah since 2014, but there is no regulatory system to oversee the oil’s safety. Bottles labeled as CBD have edged their way into Utah smoke shops and health food stores in recent years. Sales to the general public have been technically illegal but largely ignored by authorities. “It’s been a little bit of a don’t ask, don’t tell kind of a business,” said Jack Wilbur, a spokesman for the Utah Department of Agriculture and Food. There’s been no way for consumers to know if products are what they claim to be, he said. The CDC report this week found that more than half of the 52 possible cases either tested positive for a synthetic compound called 4-CCB or reporting using a product called Yolo CBD Oil, samples of which contained the synthetic instead of authentic CBD. Efforts to determine what company manufactures Yolo CBD Oil were not successful. Lt. Ryan Van Fleet, head of major crimes in the State Bureau of Investigation, said no charges were filed or stores were raided based on the illnesses. This year, the state Legislature passed reforms legalizing CBD for the general public and creating a system to register and test products for quality. 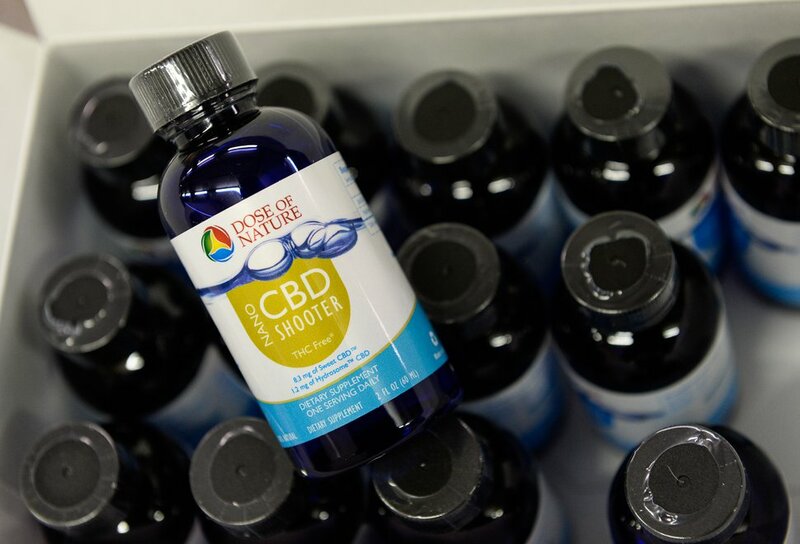 Francisco Kjolseth | The Salt Lake Tribune Utah-based company Dose of Nature is launching a line of legal Cannabidiol products made from industrial hemp extract. The CBD or Cannabidiol is one of the products available for the treatment of pediatric epilepsy, autism and other neurological conditions. Vickers said the new law should prevent people from taking synthetics falsely marketed as CBD. Nationally, 30 states have legalized some form of medical marijuana and 16 others have laws on CBD-specific medical treatment, according to the National Conference of State Legislatures. But rules for dispensing and manufacturing CBD vary widely. Marijuana activists have said Utah’s new law is not enough. They’re pushing a ballot initiative that will legalize medical marijuana beyond the narrow limits approved by state lawmakers this year, which allows use only for terminally ill patients. “These people having problems with CBD oil is 100 percent a side effect of prohibition,” said Angela Bacca, a media strategist working with advocacy group TRUCE Utah. Bacca says keeping most forms of cannabis illegal makes people desperate for treatment they can only find through unregulated products. The Utah lieutenant governor’s office will certify by June 1 whether the initiative can reach the ballot. Opponents including Vickers and the Republican Gov. Gay Herbert have said the proposal is full of loopholes that could make marijuana too easy to obtain.